The 12 communities profiled below are providing the opportunity for 41,200 grade 5-14 students to design and propose real experiments for flight aboard the International Space Station (ISS) as part of SSEP Mission 1 to ISS. A total of 92 schools in 9 States and the District of Columbia are engaged. Half of the communities participated in earlier SSEP flight opportunities on Space Shuttle missions STS-134 and STS-135. Each community has a real research mini-laboratory reserved to fly on ISS for a microgravity flight experiment selected through their local SSEP experiment design competition. The Mission 1 to ISS community leadership project that a minimum of 3,755 students will be fully engaged in experiment design, and a minimum of 880 flight experiment proposals from student teams will be received. 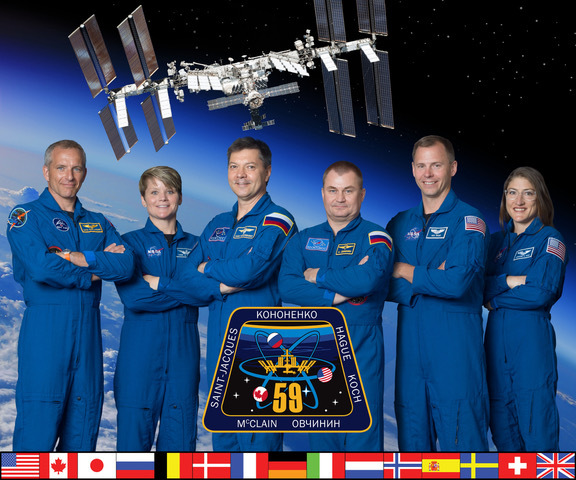 A total of 67,685 grade K-14 students are being given the opportunity to participate in SSEP Mission 1 community-wide programming, which includes the design of a Mission Patch to fly aboard ISS. San Marino Unified School District is committed to providing the students of San Marino with the best STEM education possible through access to unique resources and experiences, such as partnerships that allow our students to participate in regional and national programs. Examples include the FIRST Robotics Competition, the AMGEN-Bruce Wallace Biotechnology lab program, the USC QuiKScience Challenge, and the Solar Hydrogen Activity research Kit program (SHArK). Our high school students are offered the opportunity to listen to presentations by and join in discussions with Nobel Laureates and other prominent scientists in our science lecture series. Our Earth science, biology, chemistry, and physics courses emphasize the use of computer technology to further learning and discovery in the laboratory setting. Advanced Placement (AP) courses, such as biology, chemistry, physics, and environmental science, use even more complex computer technology for data input and analysis. The community’s participation in the Student Spaceflight Experiments Program Mission 1 to the International Space Station (ISS) provides a great opportunity for the school district to further pursue its commitment to excellence in STEM education. The program offers the students a unique opportunity to participate in real discovery science, will inspire students in science, technology, engineering, and mathematics, and involve the entire San Marino community. Given that today’s top ten highest-paying degrees are all in the fields of engineering, Chaminade College Preparatory considers it essential to add new methods to our curriculum to inspire students to pursue college studies in the areas of science, technology, engineering, and mathematics. To this end, we are pursuing numerous avenues to provide our students access to a technologically advanced learning environment through new and established partnerships. Examples include our one-to-one student laptop initiative across both of our campuses, our collaboration with the Bruce Wallace Amgen Biotechnology program, and our participation in the Toshiba ExploraVision and the Intel Talent Search programs. Our Eagle Engineering program participates in a variety of competitive endeavors including FIRST Robotics, VEX Robotics, MATE, JPL Invention Challenge, Real World Design Challenge and Cyber Patriot; the team has been recognized across the nation and on an international platform. The Student Spaceflight Experiment Program will further extend our commitment to technologically advanced education. It will provide an interdisciplinary, true science immersion experience for students across our science and engineering classes and programs. A broad collection of students will participate from our middle and high school campuses, allowing students in a wide range of grade levels to experience how real research in done. Annie Fisher STEM Magnet School and University High School of Science and Engineering bring together students of different social, economic and ethnic backgrounds together to focus on STEM education. Our mission is to create a rigorous learning environment rich in advanced academics through the integration of Science, Technology, Engineering, and Mathematics. Our core model for instruction is inquiry, which allows for hands-on experiential learning through a focused investigation approach to content delivery. At the Annie Fisher STEM Magnet School, students are exposed to engineering curriculum as early as Kindergarten, in accordance with our core philosophy that science, technology, engineering, and mathematics are the norm for all students. The University High School of Science and Engineering features a partnership with the University of Hartford, which allows early college experiences to be infused into the curriculum. Through various established partnerships, the Student Spaceflight Experiments Program allows our students the opportunity to work collaboratively with college and industry-level professionals. This real-world experience will excite students about STEM fields and help inspire them to continue their education within these fields, in this manner strengthening our K-14 program pipeline for students beginning at the elementary level to go directly into STEM careers. Stuart-Hobson Middle School (SHMS) believes in the goals of the “Educate to Innovate” initiative set forth by our nation’s President. We want to give ALL of our students the most rigorous STEM education possible through a developmentally appropriate curriculum that emphasizes experiential, participatory, hands-on methods of teaching and learning. In addition to the basic Science requirements in our school that include Earth and Space Science on 6th Grade, Life Science on 7th Grade, and Physical and Chemical Science on 8th Grade, all students are also required to take one quarter of Technology and Engineering per year. Our goal in STEM education is to increase the number of underrepresented groups, specifically minorities and females, within the STEM pipeline so that they have the ability to compete for high quality jobs in the future. The Student Spaceflight Experiments Program will be a great opportunity for our school to embrace this plan, since it will provide our students with hands-on, real-world science and technology experience, making this learning come alive. It will reinforce the wonder of science and open new pathways for them to pursue. The SSEP program will integrate into our STEM curriculum seamlessly and help us close the achievement gap. Avicenna Academy’s school community has high scores in Indiana’s standardized tests, and our current priority is fostering an ongoing love for science in our students by establishing a strong, inquiry-based science program. There is a clear connection between the investigation skills that are fine-tuned through scientific exploration and problem-solving ability. The ability to think critically and solve problems is necessary to be competitive in today’s and tomorrow’s job market. The methods used to present information and programs adopted to cultivate problem-solving ability and critical thinking skills need to be fresh, student-centered and have a real application in today’s world if they are going to be effective. SSEP is ideal in this regard, since the program’s experiment design competition requires students to utilize information they’ve gained in the classroom and expand upon it by further research and investigation. Interest level and therefore student investment is high because SSEP is a student-driven program where students are able to pursue a topic that is of interest to them. Our participation in the program allows us to bring learning out onto the playing field instead of limiting it to a classroom, and that is crucial to effective preparation for our students’ futures. The Odebolt Arthur Battle Creek-Ida Grove HS (OABCIG) Community School District is committed to providing our students with a high-quality STEM education. Of special importance in this regard are collaborations with business and education groups both locally and from a wider area to help students from rural Iowa realize that opportunities related to STEM fields are available in their immediate area as well as in the broader world. Our goals for students in STEM education include digital age literacy, inventive thinking, interactive communication skills, and quality state of the art results. The nature of the SSEP aids in all of these areas. The program will provide students with practical experience in 21st century skills of information management and communications through the process of working through the challenges of real-world science. It involves our students in a way that is highly engaging and allows them to enter the real world of science. The program also highlights the role of international collaboration, which we consider an important component for our students to truly comprehend the global economy. We see SSEP as precisely the kind of program that connects the students’ talents to the much larger world of science research and serves as a catalyst that sets off an explosion of interest in the pursuit of science. With Charles County’s location in the center of a regional technology corridor and the aging of our STEM workforce, Charles County has a goal of attracting and preparing students at all educational levels to pursue STEM coursework; supporting students to pursue postsecondary degrees; providing students and teachers with STEM related growth and research opportunities; and expanding the capacity of the school system to promote STEM education. The following programs have been developed and implemented to meet these goals: trans disciplinary curricula, Gateway and Project Lead The Way classes, lessons co-taught by scientists or engineers, and programs in which robotics and Chesapeake Bay issues introduce the use of technology with science and environmental issues. In partnership with the Space Foundation, Charles County Public Schools has put into place professional development for teachers to increase their knowledge and application of space and aerospace technologies. This provides them a good foundation to become more comfortable with fundamental space and aerospace concepts allowing them to share their knowledge and enthusiasm for aerospace engineering with their students. SSEP can support the school system’s vision by engaging students in authentic scientific thinking and problem solving as they become scientists in this historic endeavor. The strategic need for our school community in STEM Education is two-fold; it will dramatically increase student interest and prepare and inspire our next generation of scientists for STEM careers, and it will provide new opportunities for community involvement. Participation in this program will empower our students by challenging them to ask authentic questions about the world they live in. Through the STEM Education program, our students have an opportunity to generate questions and integrate knowledge from all of their educational experiences. Using math and science skills to develop and analyze an experiment, students will foster their ability to think critically. Engaging in the design competition, they will experience the competition for resources and understand the importance of the communication skills they have been learning to master. This program will also enable students to apply their unique vocational education skills to real-world problems. Beyond engaging and educating students, families, educators and the local community will benefit from this program, as well. Through exhibits and programs, and professional development opportunities, members of the Monty Tech community will assist and support teachers in STEM Education. SSEP is assisting us in meeting our long and short term goals by selecting our community for the SSEP Mission 1 to the International Space Station. The Pleasanton School District and Norris School District are primarily rural areas, agricultural in nature. Our basic goal is to prepare all our students for the future by offering them educational opportunities to excel and become responsible citizens in an ever-changing world. Our science curricula are designed to provide students with science, math and engineering/technology in sequences that build upon each other. The Student Spaceflight Experiments Program will greatly benefit our students by allowing them to experience in a hands-on, minds-on environment the world of STEM fields. The experiment design opportunity that SSEP provides is the perfect framework for students to engage in the design process that is at the heart of engineering. This experience will reaffirm our message that STEM education is a way of thinking. Students will have the opportunity to apply core content knowledge in a personalized context, while developing critical thinking skills that can be applied to all aspects of their academic and personal lives. We believe our students are future scientists, mathematicians and engineers, and the SSEP will provide Pleasanton and Norris students with the opportunity to increase their critical thinking skills, apply science concepts and engage them in the active engineering and science experiment design process. Cincinnati Public Schools (CPS) has created two STEM-themed schools—Hughes STEM High School and Taft STEM Elementary—to meet the needs of students who will live in a complex society and global economy. Authentic learning strategies such as inquiry, engineering design, and problem- and project-based instruction are central strategies for teaching integrated STEM content and processes. Students learn to solve real-world problems and apply that knowledge in creative and innovative ways. The schools have well-defined STEM curricula with the view that STEM is more than the subjects that make up the acronym. STEM is an approach to education to increase access to learning and skills necessary for the 21st century for ALL students, so that they have the knowledge and skills necessary for success in a highly technological world. The Student Spaceflight Experiments Program gives the schools the perfect opportunity to apply the skills developed as part of the STEM curricula—such as literacy, critical thinking, communication, and collaborative skills, in addition to the basic STEM disciplines—to a capstone design competition that immerses the participating students in real science. Having an experiment designed by CPS students to actually fly in orbit aboard the International Space Station will provide both incentive and inspiration to our students and teachers. Two schools from urban southwest Houston are participating in the Student Spaceflight Experiments Program as an education community, with over 1,700 students from a wide variety of racial and economic backgrounds impacted through this effort. The participating schools are dedicated to providing real-world science, technology, engineering and math (STEM) opportunities that will enhance the students’ application of principles and ideas taught in the classroom as part of state mandated curriculum. We believe that STEM can be effectively taught only when the students have the opportunity to apply their knowledge through the use of the scientific process in real-world situations. The schools participate in several projects providing students with this opportunity, such as Geoforce, NASA Explorer Schools design challenges and National Student Symposium; NASA’s Summer of Innovation; the Society for Women Engineer’s launch and recovery challenge; a student-led Habitat Garden; and International Space Station (ISS) downlinks. The Student Spaceflight Experiments Program provides an excellent opportunity for our students to apply the skills they have learned to the real world of science via an experiment to be conducted in the unique environment of the International Space Station. The El Paso Community College (EPCC) and the Transmountain T-STEM Early College High School (TMECHS) collaboratively work toward expanding the number of graduates in the El Paso, Texas community with Associate’s degrees in STEM-related career fields. EPCC is a multi-campus, Hispanic Serving Institution that serves 30,000 students. The Transmountain Campus provides educational programs for northeast El Paso and serves over 4,000 credit students each semester. In 2008, a partnership was established between the two entities that provides hands-on STEM research experiences that address community needs and potential solutions. The direct focus and alignment to community needs creates awareness for the benefits of producing additional STEM graduates in a predominantly Hispanic community. The SSEP experience, started with the community participating in the STS-134 flight opportunity, allows our students to collaboratively conduct experiments that enhance and extend their local STEM research experiences. By participating in the mission to the International Space Station, the student researchers are given the chance to think outside the box; connect their learning to a cutting edge and high profile scientific and educational opportunity; and make use of resources beyond the El Paso area that would otherwise be unavailable. The opportunity is truly an “out of this world” experience for the El Paso community. This will be a life-changing experience that we hope will serve as the inspiration for many of our students to enter the STEM fields.